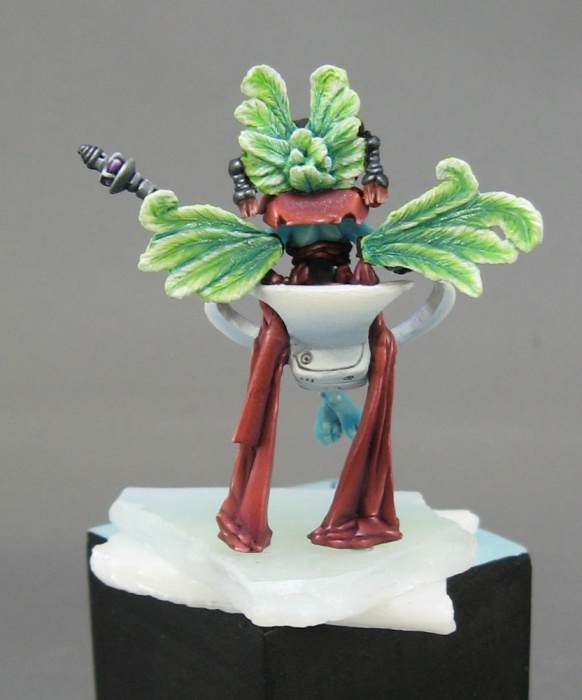 Here is my recent little fem-bot for Reaper's Chronoscope line. She is sort of a re-sculpt of another bot I did several years ago that was very thin and quite soft in the details. Taking my inspiration from the art deco designs in the movie Metropolis, I wanted to sort of reinvent her a little sleeker and trim. The original design required an actress fit inside the costume. Here I was able to for the shape more lean and light. The lines on this figure are also much crisper than the original one I sculpted out of "greenstuff". This one is all ProCreate over a wire armature and she is aproxamately 30mm tall. Sculpting models like this with ProCreate works better for me because this particular material has less "memory" or elasticity than the green Kneadatite putty used by many of the other figure sculptors. There is still quite a bit of flexibility to the gray stuff once it is cured but the working properties are very similar to the feel of Kneadatite's brown putty. Gray stuff can be drilled, filed, scraped and sanded once it cures but it is not brittle and prone to crumbling or breaking like brown Kneadatite. I find it extremely versatile. Congratulations are in order to painter Meg Maples! She won the Gold Medal in Reaper's Painter Category for Messalina IV Andromedan Empress. Meg has also gone on to Seattle to be a staff painter at Privateer Press and will be painting all sorts of cool Warjacks and Warbeasts soon. I commissioned her to paint this piece for me before it was sculpted and I'm very happy with the results. It is now on display in my private collection with my other award-winning sculpts and painted figures.